-Pain - local to the TMJ, radiating into teeth, across face and/or scalp. Can be associated with headaches and neck tension. -Reduced Range of Motion - inability to open mouth fully, or move to one side or the other. -Neuromuscular massage and fascial techniques to the face, scalp, as well as the upper back, pectorals, and neck. -CranioSacral techniques to support joint alignment and encourage fascial release. What you can expect from an appointment? -Education and home care exercises - to assist in becoming more aware of - and correcting - patterns that are creating imbalance. -Clear Communication and Ongoing Consent - intra-oral techniques, in particular, can be unfamiliar territory. I work with clients to ensure a level of comfort throughout treatment. 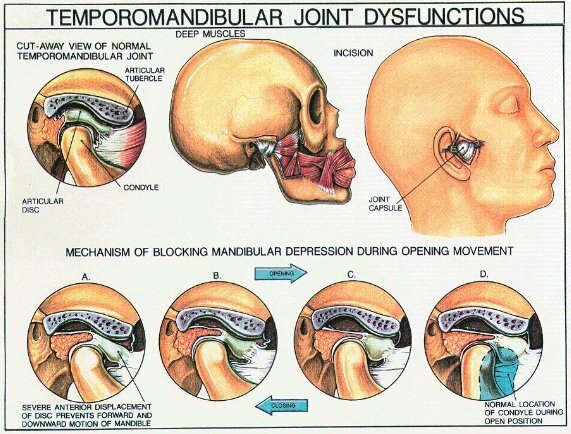 As an aside, it is worth noting the role that massage of the TMJ can play for musicians and speakers. Singers, brass and wind instrumentalists as well as teachers, broadcasters and other public speakers will all know the value of good jaw mechanics. If there is stiffness, pain or joint clicking there may be a reduction in air flow, vocal projection, resonance or embouchure stamina.